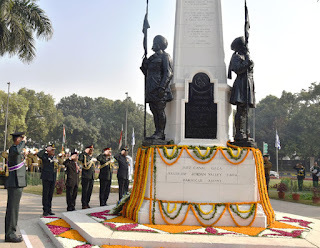 The Battle of Haifa was fought on 23 September 1918 and every year on this date the Indian Army celebrates Haifa Day to pay respect to the martyred Indian soldiers. Battle of Haifa is considered to be one of the most bravely-contested battles of World War I. The battle of Haifa, won with the help of Indian princely state Armies, is also remembered as the last successful horse cavalry action. The biggest lesson of the World War-I was that horse cavalry was no longer relevant in the battlefield as a weapon of offence, primarily because of trench warfare machine gun advances in artillery and introduction of barbed wire. The Haifa attack and its victory will always be dedicated to the Indian soldiers from the princely states like Jodhpur and Mysore. The Battle of Haifa was fought on 23 September 1918 towards the end of the Battle of Sharon which together with the Battle of Nablus formed the set piece Battle of Megiddo fought between 19 and 25 September during the last months of the Sinai and Palestine Campaign of the First World War. During the Battle of Haifa, the Indian 15th (Imperial Service) Cavalry Brigade, 5th Cavalry Division and part of the Desert Mounted Corps attacked rearguard forces of the Ottoman Empire that resulted in the capture of the towns of Haifa and Acre. This attack took place at the north western edge of the Esdraelon Plain (also known as the Jezreel Valley and the plain of Armageddon) 40–50 miles (64–80 km) behind the front line in the Judean Hills after the Desert Mounted Corps had occupied the plain, during the cavalry phase of the Battle of Sharon. The Battle of Megiddo had begun with an attack by British Empire infantry along an almost continuous line from the Mediterranean Sea across the Plain of Sharon into the foothills of the Judean Hills. They attacked the Ottoman front line and captured the headquarters of the Ottoman Eighth Army at Tulkarm, the trenches at Tabsor and pivoted at Arara. The Eighth Army was outflanked on the coast and British Empire cavalry moved north through the gap created. The Desert Mounted Corps almost encircled the infantry in the Judean Hills capturing their main lines of supply, communications and retreat. By 25 September, one Ottoman army had been destroyed, and what remained of two others, were in retreat northwards to Damascus. The 5th Cavalry Division was assigned the task of capturing Haifa and Acre after several earlier attempts were stopped by strong rearguard positions. A squadron from the Mysore Lancers, and a squadron from the Sherwood Rangers Yeomanry, 15th (Imperial Service) Cavalry Brigade formed the initial attack on an Austrian artillery battery before moving forward with the Jodhpur Lancers and a light car patrol, to attack the main German rearguard position and capture the town. The Prime Minister, Shri Narendra Modi has saluted the brave Indian soldiers who laid down their lives to liberate Haifa in 1918.